Tracks 3-8, and 11-13 were recorded a while back in Roger's living room, all in one take. Roger is playing and singing simultaneously into two artfully placed microphones while sitting in a rocking chair. Although these might sound like multi-track guitar recordings, there is only one guitar, his 1978 C.F. Martin M-38, being played with a flat pick in Roger's singular style; with melodies, counter-melodies, bass, solos and chords concurrently supporting his vocals. These rocking chair songs were produced by Roger Deitz and Randy Poe. Roger has added to these, multi-track songs 1,2, 9,10 and 14 that were studio recorded by Bill Kollar at London by Night Productions, Woodbridge, NJ and co-produced by Lynne White. Final mastering and sequencing of Love Songs; Now and Then by Glenn M. Taylor, Taylor-Made Productions, Caldwell, NJ. Cover Photo – Morris and Sophie Deitz – on their wedding day, March 14, 1936. 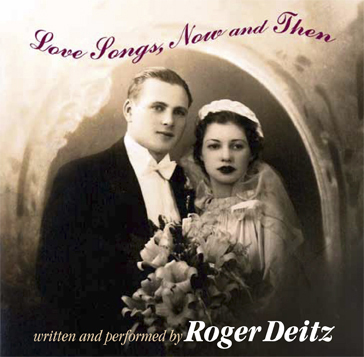 The CD Love Songs, Now and Then – as well as downloads of the songs are available from cdbaby – http://www.cdbaby.com/cd/rogerdeitz. Song downloads are also available at Amazon, iTunes (open iTunes and search Roger Deitz), and a host of other downloading sites. 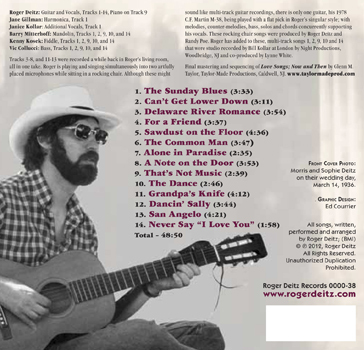 More information on the album, and samples of each song may be found at http://www.cdbaby.com/cd/rogerdeitz .